TOKYO, April 10, 2019 /PRNewswire/ — The Guangdong-Hong Kong-Macao Greater Bay Area Roadshow was held in Tokyo, Japan on April 9th, aiming to increase its global presence. Among the attendees, there was a delegation led by Ma Xingrui, governor of China’s Guangdong Province. 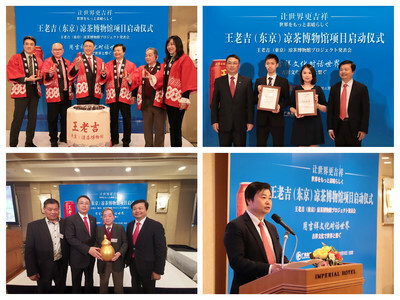 On the same day, the Chinese herbal tea brand Wang Lao Ji, from Guangzhou Pharmaceutical Holdings (GPH), launched its overseas herbal tea museum project in Tokyo, with the theme "Connect the World through the Auspicious Culture." This showcases the company’s commitment to advancing the Greater Bay Area, both economically and culturally, and to achieving its global strategy. Established in 1828, Wang Lao Ji, the inaugurator of China’s herbal teas, has developed into a household name in China as a healthy botanical beverage. Its herbal tea museum in Tokyo, scheduled to open at the end of 2019, will present its herbal tea history through multimedia. Japanese friends will have an authentic sip of China while experiencing the innovation and glamour of Chinese culture. The overseas museum project, initiated by the Guangdong-based industry giant, serves as a window for foreign exchanges and promotion of the Lingnan and auspicious cultures. Over years its distribution network in Japan has covered main cities with a relatively larger Chinese population, including Tokyo, Osaka, Chiba, Yokohama, Kobe and Okinawa. At present, Japan is Wang Lao Ji’s biggest export market in East Asia. "With outstanding Chinese brands, we can tell China’s stories well," said GPH’s president Li Chuyuan, "Going forward, Wang Lao Ji will stay committed to empowering its products with enriched auspicious culture to connect the world and increase the global presence of the herbal tea industry. With that, the Chinese culture and homegrown brands will grow and prosper in the world."